As a man who could not read or write and lacked the critical skills to find employment, Chek Chin was struggling to make ends meet with his family. Basic necessities like food, healthcare and his children’s education were an ongoing struggle until he found out about Cufa’s Village Entrepreneur program. It all started when he noticed his neighbour’s chicken farming business excelling. His neighbour was a participant in Cufa’s Village Entrepreneur program. This led Chek to go to his local community-owned bank to sign up for sponsorship. 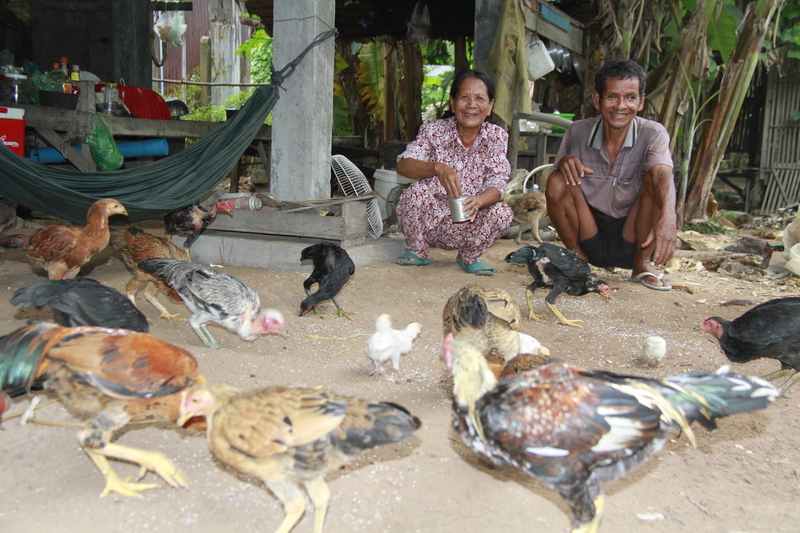 Initially, Chek started off the program by setting up a chicken farm. However, once he had developed his chicken farm, he started a second business building and selling cement stairways. This business was very successful because of the large amount of raised houses in Cambodia. Recently, Chek was determined to have a sustainable business by Cufa project officers. Throughout the program, Cufa project officers gave Chek assistance and guidance, with quarterly field trips to see successful businesses, one-on-one support and more. Thanks to this, Chek not only was able to learn how to make good quality stairs and effectively farm chickens but also gained a strong understanding of market assessments, business admin and chicken food production. Chek now has a quarterly income of $943.74 but that did not come without challenges. Throughout the program, his biggest challenge was the competition from other local chicken farms. However, starting a second business to differentiate helped his income. Additionally, consistently promoting his business and maintaining customer relationships meant that this issue was easily overcome. Want to assist someone like Chek? Find out how you can contribute this holiday season.